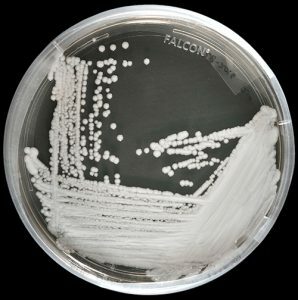 Candida auris is an emerging fungus that presents a serious global health threat. C. auris causes severe illness in hospitalized patients in several countries, including the United States. Patients can remain colonized with C. auris for a long time and C. auris can persist on surfaces in healthcare environments. This can result in spread of C. auris between patients in healthcare facilities. Most C. auris cases in the United States have been detected in the New York City area, New Jersey, and the Chicago area. Strains of C. auris in the United States have been linked to other parts of the world. U.S. C. auris cases are a result of inadvertent introduction into the United States from a patient who recently received healthcare in a country where C. auris has been reported or a result of local spread after such an introduction. There are now 174 cases of Candida auris infections in the United States, 17 more than the CDC reported last month. Most C. auris cases in the United States have been detected in the New York City area and New Jersey. Strains of C. auris in the United States have been linked to other parts of the world. U.S. C. auris cases are a result of inadvertent introduction into the United States from a patient who recently received healthcare in a country where C. auris has been reported or a result of local spread after such an introduction. Cases are categorized by the state where the specimen was collected. Most probable cases were identified when laboratories with current cases of C. auris reviewed past microbiology records for C. auris. Isolates were not available for confirmation. Early detection of C. auris is essential for containing its spread in healthcare facilities. Beyond the clinical case counts reported above, an additional 257 patients have been found to be colonized with C. auris by targeted screening in four states with clinical cases. CDC encourages all U.S. laboratories that identify C. auris to notify their state or local public health authorities and CDC at candidaauris@cdc.gov. CDC is working closely with public health and healthcare partners to prevent and respond to C. auris infections. The CDC-sponsored Antibiotic Resistance Laboratory Network (ARLN) will help improve detection and response to C. auris nationwide. Single cases of C. auris have been reported from Germany, Japan, Kuwait, and Norway. Multiple cases of C. auris have been reported from Canada, Colombia, India, Israel, Kenya, Oman, Pakistan, Panama, South Korea, South Africa, Spain, the United Kingdom, the United States (primarily from New York City Metropolitan Area and New Jersey) and Venezuela; in some of these countries, extensive transmission of C. auris has been documented in more than one hospital. U.S. cases of C. auris have been found in patients who had recent stays in healthcare facilities in India, Pakistan, South Africa and Venezuela, which also have documented transmission. Other countries not highlighted on this map may also have undetected or unreported C. auris cases. The United States: 126 confirmed cases of Candida auris as of Aug 31. Please note that as of September 18, 2017, the total case counts reported include both probable and confirmed clinical cases; previously reported case counts included only confirmed cases. Case counts for some states are quite a bit higher than those listed before September 18, 2017 because of the change in reporting, and not because of a large increase in new cases. Read more below about how cases are defined. 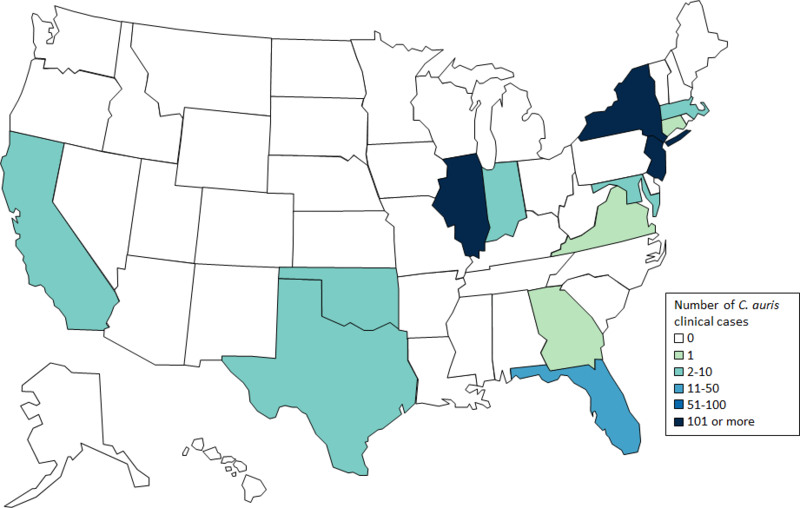 Beyond the clinical case counts reported above, an additional 143 patients have been found to be colonized with C. auris by targeted screening in four states with clinical cases. CDC will update case counts monthly. Candida auris is an emerging fungus that presents a serious global health threat. Candida auris is an emerging fungus that presents a serious global health threat. Healthcare facilities in several countries have reported that C. auris has caused severe illness in hospitalized patients. Some strains of C. auris are resistant to all three major classes of antifungal drugs. This type of multidrug resistance has not been seen before in other species of Candida. Also of concern, C. auris can persist on surfaces in healthcare environments and spread between patients in healthcare facilities. CDC has developed identification(https://www.cdc.gov/fungal/diseases/candidiasis/recommendations.html), treatment(https://www.cdc.gov/fungal/diseases/candidiasis/c-auris-treatment.html), and infection control(https://www.cdc.gov/fungal/diseases/candidiasis/c-auris-infection-control.html) recommendations to help prevent the spread of C. auris. Location represents the state of C. auris specimen collection. The case counts displayed reflect clinical cases of C. auris (i.e., based on specimens collected in the normal course of care). They do not include patients who screened for presence of C. auris colonization. C. auris has been isolated from an additional 120 patients from healthcare facilities in 4 states where clinical cases were detected. This map will be updated monthly. Tsay, S., et. al. Ongoing Transmission of Candida auris in Health Care Facilities — United States, June 2016–May 2017(https://www.cdc.gov/mmwr/volumes/66/wr/mm6619a7.htm). MMWR, 2017, May 18. Berkow, et al. In vitro activity of a novel glucan synthase inhibitor, SCY-078, against clinical isolates of Candida auris. Antimicrob Agents Chemother. 2017 May 8. Vallabhaneni, S., et. al. Investigation of the first seven reported U.S. cases of Candida auris, a globally-emerging invasive fungus — United States, May 2013–August 2016(https://www.cdc.gov/mmwr/volumes/65/wr/mm6544e1.htm?s_cid=mm6544e1_w) . MMWR, 2016, Nov 4. Lockhart, S., et al., Simultaneous emergence of multidrug resistant Candida auris on three continents confirmed by whole genome sequencing and epidemiological analyses. Clinical Infectious Dis, 2016, Oct 20. Ben-Ami, R., et al., Multidrug-Resistant Candida haemulonii and C. auris, Tel Aviv, Israel. Emerg Infect Dis, 2017. 23(2): p.195-203. Choi, et al. Otomastoiditis caused by Candida auris: Case report and literature review. Mycoses. 2017 Apr 5. Gaitán, A.C.R., et al. Nosocomial fungemia by Candida auris: First four reported cases in continental Europe. Rev Iberoam Micol, 2017, Jan 25. Borman, A.M., et al. Isolates of the emerging pathogen Candida auris present in the UK have several geographic origins. Med Mycol. 2017 Feb 16. Schelenz, S., et al. First hospital outbreak of the globally emerging Candida auris in a European hospital. Antimicrob Resist Infect Control. 2016 Oct 19; 5:35. Calvo, B., et al. First report of Candida auris in America: Clinical and microbiological aspects of 18 episodes of candidemia. J Infect, 2016. 73(4): p.369-74. European Centre for Disease Prevention and Control. Candida auris in healthcare settings – Europe – 19 December 2016. Stockholm: ECDC; 2016. Candida auris identified in England. Public Health England. 2016, July 1. Candida auris: laboratory investigation, management and infection prevention and control. Public Health England. 2016, June 27. Larkin, E., et al. The emerging pathogen Candida auris: Growth phenotype, virulence factors, activity of antifungals, and effect of SCY-078, a novel glucan synthesis inhibitor, on growth morphology and biofilm formation. Antimicrob Agents Chemother. 2017 Apr 24;61(5). Mizusawa, M., et al. Can a multi-drug resistant Candida auris be reliably identified in clinical microbiology laboratories? J. Clin. Microbiol, 2016, Nov 23. Sherry, L., et al., Biofilm-Forming Capability of Highly Virulent, Multidrug-Resistant Candida auris. Emerg Infect Dis, 2017.23(2): p. 328-31. Azar, M.M., et al. Donor-derived transmission of Candida auris during lung transplantation. Clin Infect Dis. 2017 May 17. Clancy, C.J., et al. Emergence of Candida auris: an international call-to-arms. Clinical Infectious Dis, 2016, Oct 20. Candida auris is an emerging fungus that presents a serious global health threat. Healthcare facilities in several countries have reported that C. auris has caused severe illness in hospitalized patients. Some strains of Candida auris are resistant to all three major classes of antifungal drugs. This type of multidrug resistance has not been seen before in other species of Candida. Also of concern, C. auris can persist on surfaces in healthcare environments and spread between patients in healthcare facilities, unlike most other Candida species. CDC has developed Interim Recommendations(https://www.cdc.gov/fungal/diseases/candidiasis/recommendations.html) to help prevent the spread of C. auris. C. auris is difficult to identify with standard laboratory methods and can be misidentified in labs without specific technology. CDC encourages all U.S. laboratory staff who identify C. auris strains to notify their state or local public health authorities and CDC at candidaauris@cdc.gov. Find answers to frequently asked questions about C. auris on our questions and answers page(https://www.cdc.gov/fungal/diseases/candidiasis/candida-auris-qanda.html) and in the Candida auris: Interim Recommendations(https://www.cdc.gov/fungal/diseases/candidiasis/recommendations.html). CDC is working with state and local health departments to identify and investigate cases of C. auris. 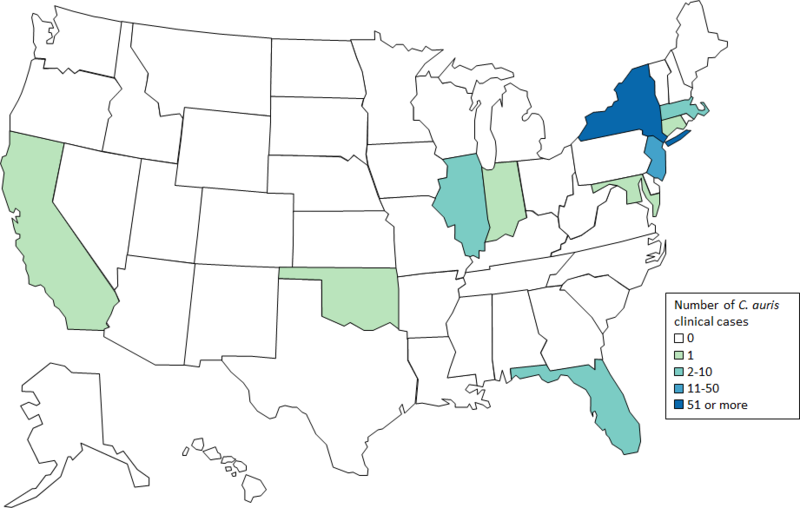 The following map displays where C. auris cases have been identified in the United States as of April 13, 2017.